Khimsar is a tiny village lying in the heart of Rajasthan. Khimsar is about a travel of 92 km on the highway from Jodhpur to Bikaner in Rajasthan. Khimsar Village is a doorway to explore the district of Nagaur in Rajasthan. It is an interesting tourist spot lying midway between Jodhpur and Bikaner. Khimsar is well known for its excellent road network which is successfully connecting the important tourist destinations in the region including Jodhpur, Bikaner and Nagaur. Every year many tourists come to Khimsar. Hotels in Khimsar are ample and well maintained. Infact tourism is the leading industry in entire Rajasthan. Hotels in Khimsar are luxurious enough to treat you like an emperor. Most important hotels in Khimsar are namely Hotel Khimsar Fort, Khimsar Sand Dunes Village The heritage hotels of Khimsar are an experience in themselves as from every corner of the mansions you can get the flavor of the historical references. The opportunities they provide are luxurious in nature and provide good value for money. In order to make the travel tour to Khimsar even more joyful, choose the right kind of accommodation in the hotels of Khimsar. 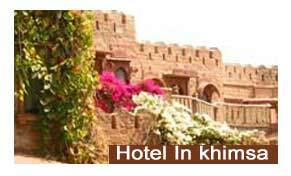 Stay at the hotels in Khimsar and make the holiday special for you and for your family and friends.